' Simple Apron - Sisters, What! Our Relief Society Presidency, (In our church this is what the woman's organization is called) hosted a crossing over ceremony for the girls turning 18 and entering Relief Society. One of the things we gave them was an apron to remind them that Relief Society Woman roll up their sleeves and put on their aprons and go to work when needed. I was asked to make the aprons. Actually, I think it was more out of pity since I don't get to sew much having 3 boys. But I did enjoy putting these together. I found a great tutorial over on Feathered Nest. I did it in the colors, purple, white and green because those colors have represented our Ward's Relief Society's Goals for the year. Anjuli those are really cute!! Those turned out really nice. I like that you guys have colors for your goals. Amazing...you look like a 50's house wife. I love it. I really need to get a calling so I can do great projects like this too. 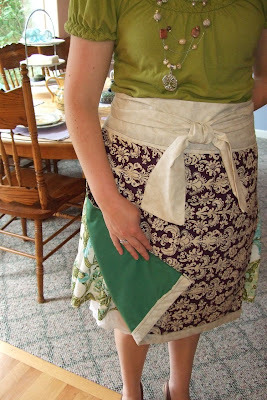 I love the simplicity to this apron. It turned out beautiful!